Colonial language (as stated in Part II ) lessens, blurs, and erases historical truths, warping visitor understanding of how museums acquire objects. This post addresses the British Museum, but museums around the world are guilty of colonial language. Colonial language is something we need to consciously look for. It has become so ingrained in the way history is written, for many it can initially read as natural. Marabou believes that we must approach our history books, museum catalogs, and gallery labels with critical eyes because the colonialist filter distorts our understanding of history. Historical wrongdoings and injustice are often swept aside by those who say history is the past, let’s look to the future. The uncomfortable truth is this: the impact of historical injustice and perpetuation of incomplete, edited histories is very much felt today. To illustrate this point, Marabou has developed a case study that analyzes the way objects from the Kingdoms of Benin and Ife (in present-day Nigeria) are displayed and spoken about at the British Museum. By the late 1800s the British had established trade with the Kingdom of Benin and the Edo people in present-day Nigeria. Over time, trade relations between the British and the Oba (king) of Benin became increasingly strained. The British did not like the fact that the Oba was cutting off trade with them, and in November 1896 sent an envoy to force communication and negotiation. The British accounts report (as does the British Museum) that the British envoy was violently attacked by Edo soldiers. No British provocation is mentioned. In reality, there was British provocation. There is variation in the accounts of how the British provoked the Edo people to respond in the way they did, and details can be hard to find, but the main point is that when Oba Ovonramwen said it was not the right time for the British to visit his court, the British did not respect his request. The Chicago Institute of Art shares this pared-down version of the account in relation to their collection of Benin Bronzes. Other sources, particularly sources from non-Western scholarship provide important details that complicate the story told by the British to justify the Punitive Expedition. In “Igue festival and the British invasion of Benin 1897: the violation of a people’s culture and sovereignty,” an article published in the African Journal of History and Culture, Charles O. Osarumwense provides some context as to why the Oba asked the British to wait and postpone their trip. More importantly, the article provides an Edo perspective on the event. Osarumwense explains that Oba Ovonramwen said the British must wait because the timing of their visit coincided with a ceremonial season for the Edo people, particularly the observance of Igue. During this time, visitors to the community were not allowed and all routes leading to Benin City were closed off. Ovonramwen writes, “The festival was unique in the sense that it was a period when the Oba embarks on spiritual cleansing and prayers to departed ancestors for continued protection and growth of the land. The period of the festival was uncompromising and spiritually adhered to.” The British did not wait. The Oba dispatched chiefs to communicate that he was unavailable to meet with the British, but the chiefs disobeyed the Oba and instead attacked the envoy. Only two British men survived. News of this clash made its way back to England and was sensationalized in newspaper headlines. The details of why the Edo chiefs attacked were left out. The men who died were martyred. This lead to the justification of the British Punitive Expedition of 1897. On February 9, 1897 the British attacked the Benin Kingdom, pillaged Benin City of its art and burned the city, including the Oba’s palace, to the ground. The Oba was exiled. Thousands of Benin art works were brought to England. Some objects eventually made their way into the British Museum while others were auctioned off to global buyers to pay for the expedition expenses. The British Punitive expedition exposed a larger part of the world to African Art. 56 bronze plaques pillaged from the Kingdom of Benin in 1897 currently on display in the British Museum. Following the British occupation of attack on Benin City (Edo) in 1897 objects made of brass, ivory and wood were seized by the British force from the royal quarters and various storerooms. The British Museum successfully petitioned the Government to safeguard some of these objects acquire and display some of these pillaged objects…Numerous other objects brought out of stolen from the city were sold or exchanged on the coast; many pieces were brought to the UK where they were sold through private auction or were retained by soldiers of the expedition kept by soldiers who took part in looting the city during the expedition. Just a simple adjustment of language makes a dramatic difference in the way the expedition is understood. The British Museum says it is “safeguarding” Benin objects. But safeguarding from whom? The acquisition text about the Benin bronzes reflects the colonial tone that frames the actions of the British as justified, characterizing violators as benevolent caretakers and preservers of a conquered culture. The language is the galleries is unsurprisingly not much better and continues the incomplete narrative that says the British were attacked by the Edo, rationalizing the expedition as a reasonable form of retaliation. Benin has been a powerful state in West Africa since the 13th century. Europeans first visited Benin in the late 15th century, and early Western accounts of Benin were highly favourable. However, as Western interests encroached on the area in the late 19th century, Benin was increasingly depicted as a place of oppression and human sacrifice. This text does a fair job of explaining the way Europeans twisted portrayals of Benin once the kingdom was seen as a barrier between Europeans and the lucrative resources found in West Africa. The perception of Benin went from “civilized” to “savage,” a keen public relations move feeding the “white savior” mentality that the colonist is saving uncivilized natives from themselves. The language around the 1897 Punitive Expedition simply says the Edo attacked, so we attacked back. Marabou finds it interesting that the brass objects “fell” to the troops. It is not clear which victims were compensated through the sale of the Benin bronzes, but they were likely the families of the men who died in the initial conflict that sparked the punitive expedition. The West discovered Benin art following the sack of Benin City by the British in 1897. In the 1890s Benin resisted British control over southern Nigeria. In March 1897, retaliating for the killing of British representatives, a punitive expedition conquered the capital. Thousands of treasures were taken as booty, including around 1000 brass plaques from the palace…. Between the 1950s and 1970s the British Museum sold around 30 objects to Nigeria. The British version of the story is told not once, but twice within the same gallery, reinforcing the idea that a punitive expedition was justified. The term “booty” is accurate, but the reader may be sympathetic to the British cause because the preceding sentence mentions that British representatives were killed. There is no mention of how the city was leveled by fire and no mention of other violent actions taken against the people of the Benin kingdom. This is an example of what Marabou calls a “There we said it.” moment, uncomfortable content is shared, but not addressed. The British Museum acknowledges the conquering and pillaging of Benin City, but leaves much to be desired regarding how to resolve the unabashed display of pillaged items that surround the visitor reading the gallery text. The last line of the “Discovery of Benin Art” mentions the return of objects back to Nigeria, but return meant Nigeria had to buy back items that were stolen from its people. Perhaps included to show British desire to reconcile, this sentence does not resolve a history of invasion, theft, and oppression. Those who take the time to think about what it means for the British to conquer a city in a punitive (meant to punish) expedition and take thousands of objects as booty may wonder about the ethics of having stolen objects unapologetically on display in the British Museum. If you are unable to visit the British Museum in person, there are plenty of publications printed by the institution to learn about the objects in their collection. The 2013 British Museum publication A History of the World in 100 Objects by Neil MacGregor (former director of the museum) has a compelling premise of telling world history through an object-centric lens. Each object has an essay that explores its significance. The tone is friendly and accessible. Marabou appreciates many of the entries. When it comes to discussing objects from present-day Nigeria, Marabou can’t help but notice defensive language that skirts complicated historical and contemporary issues. The arrival and reception of these completely unknown sculptures caused a sensation in Europe. It is not too much to say that they changed European understanding of African history and African culture. MacGregor’s account of the expedition is more accurate than what is presented on the British Museum’s website and in its galleries. However, MacGregor casts doubt by saying it’s not clear what really happened, and so, the British could be justified in their retaliation. The essay mentions the transatlantic slave trade and the European scramble to carve up Africa in passing. MacGregor uses a quote from Wole Soyinka (page 502), a Nigerian artist and Nobel laureate, in which Soyinka describes the mixed emotions Benin bronzes stir within him, on one hand pride of heritage but on the other, the “sense of degradation that has taken over many African societies, to the extent that we forget we were once a functioning people before the negative incursion of foreign powers.” Soyinka also refers to the objects as “looted” in his quote. MacGregor concludes his essay with this closing line, “They [Benin bronze plaques] are arresting works of art, evidence that in the sixteenth century European and Africa were able to deal with each other on equal terms [referring to relations with Portugal], but also contested objects of the colonial narrative.” Although acknowledged with more accurate language, MacGregor avoids addressing British colonial violence and its continuing impact (illustrated in Soyinka’s quote). This is another example of “There, we said it.” The uncomfortable truth has been said and it hangs in the air without apology or further discussion. Soyinka’s quote describes the generational trauma experienced by the descendants of those who were subjected to European colonial practices and violence. MacGregor follows Soyinka’s quote with the sentence, “The Benin plaques, powerfully charged objects, still move us today as they did when they first arrived in Europe, a hundred years ago.” Marabou finds this insensitive. The gravity of what Soyinka shares in a few lines of text is not further explored. This lack of accountability for past wrongs is also expressed in another essay by MacGregor in the same book, this time in regard to the Ife Head Sculpture, also from present-day Nigeria. It’s easy to mock Frobenius, but at the beginning of the twentieth century Europeans had very limited knowledge of African art. For painters like Picasso, Nolde or Matisse, African art was Dionysiac, exuberant and frenetic, visceral and emotional. But the restrained, rational, Apollonian sculptures of the Ife clearly came from an orderly world of technological sophistication, sacred power and courtly hierarchy, a world in every way comparable with the historic societies of Europe and Asia. Marabou finds MacGregor’s defense of Frobenius confusing and frustrating. In the essay about the Benin bronze plaque MacGregor described how the plaques “caused a sensation” in Europe and credited them with changing the way Europeans perceived African art and culture. If MacGregor states this about objects found 13 years prior to the unearthing of the first Ife Head, how can he justify his defense of Frobenius? To challenge this, Marabou has two points. First, the objects stolen from the Kingdom of Benin show complex artisanship, but also are a result of advanced social structure – the plaques alone were made, commissioned, in the sixteenth century to adorn the walls of the Oba’s palace. On top of that they show a formalized court system and trade relations between Benin and Portugal. If the art itself was not seen as on par with European standards, in the very least the imagery on the plaques present complex political, social, and economic structures within Benin by the 1400s. Second, Frobenius is writing in 1910. Although this is just 13 years later, researchers like Frobenius would have had access to objects like those that arrived in Europe in 1897. Yes, Europeans in general would have “very limited knowledge” of African art, but researchers like Frobenius would be much more informed. We have to acknowledge that Frobenius’ interpretation of who made the Ife head sculpture is based on more than just lack of exposure to African art. When MacGregor defends Frobenius he is also defending the colonial constructs that created a racialized hierarchy and power dynamic, both of which have affected the interpretation of objects from non-Western cultures for hundreds of years. MacGregor does mention bias against black people during the early twentieth century, but Marabou thinks it would have been more effective (and responsible) for MacGregor to just openly acknowledge that Frobenius’ hypothesis was racist. Frobenius’ interpretation dismissed the cultural and artistic agency of African people and perpetuated the colonial myth that Africans (and other populations subjected to colonial forces) were in need of “civilizing” by western Europeans. Stylistically similar to the celebrated works from the Kingdom of Ife (which prospered c.1100–1400 CE in modern Nigeria), this head may be a copy of a terracotta or brass original. Extraordinarily, it is only a little over a century since the German anthropologist Leo Frobenius (1873–1938) was so surprised by the discovery of the Ife heads that he deduced that the lost island of Atlantis had sunk off the Nigerian coast, enabling descendants of the Greek survivors to make the skillfully executed works. Without the exhibition guide, viewers are left to interpret the object themselves. Where images of Hindu deities, Greco-Roman mythological beings, and ancient Egyptian art have made their way into mainstream knowledge, the general public is likely unfamiliar with the original Ife Head and the art of Africa. It is this lack of familiarity and Hirst’s failure to provide proper context that sparked dispute. Artist Victor Ehikhamenor spoke up, pointing out the perpetuation of colonialism and the implications of iterative work inspired by oppressed cultures. Ehikhamenor said it best in an Instagram post made shortly after the opening of Hirst’s exhibition at the Biennale. The British are back for more from 1897 to 2017. The Oni of Ife must hear this. “Golden heads (Female)” by Damien Hirst currently part of his Venice show “Treasures from the Wreck of the Unbelievable” at Palazzo Grassi. For the thousands of viewers seeing this for the first time, they won’t think Ife, they won’t think Nigeria. Their young ones will grow up to know this work as Damien Hirst’s. As time passes it will pass for a Damien Hirst regardless of his small print caption. The narrative will shift and the young Ife or Nigerian contemporary artist will someday be told by a long nose critic “Your work reminds me of Damien Hirst’s Golden Head”. We need more biographers for our forgotten. This postcard of “Golden heads (Female)” by Damien Hirst with no reference to Ife and great artists that originally made these timeless classic will travel far and wide. Once again the hunter has glorified his tale in the absence of the lion. Hirst provides minimal context for “Golden head (female).” When he does, the exhibition guide leaves the reader thinking about Leo Frobenius and perpetuates the ridiculous postulation that mythical Atlantians, not the Yoruba people of Ife, made such exceptional work. Hirst is following directly in the path laid by the British Museum. The lack of proper historical context and proper, clear attribution perpetuates the erasure of a people’s culture and history for the benefit and profit of a wealthy, white, European (even more specifically, British). The parallels are eerily close, history is indeed repeating itself as highlighted by Ehikhamenor. This is not a strange coincidence. 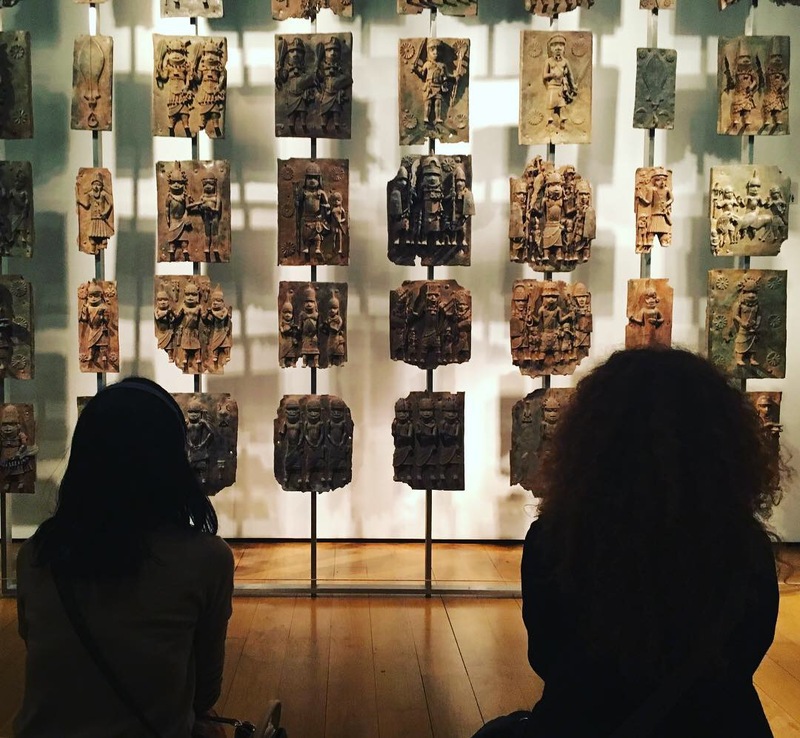 Visitors to institutions like the British Museum have been taught, generation after generation, to think in about African history and African art in a very particular way. This perspective has been shaped by the language used, directing people to shake their head at the savage actions taken by those trying to resist invasion and exploitation (like the Edo against the British envoy) and to sympathize with the “benevolent” colonizer who was supposedly “attacked without provocation.” After a few generations, an unconscious entitlement develops among descendants of colonizers. They innately believe they have the right to the ideas, culture, and land of others. Damien Hirst’s “Golden Head (female)” is an example of this unconscious colonial entitlement. There was not much response from Hirst’s camp about the controversy. He directed questions to curator Elena Guena who didn’t say much except that the Ife Kingdom is mentioned in the gallery label and in the exhibition guide. It’s not surprising that when Hirst and his team could not control the conversation they eventually resorted to silence, yet another tool within the colonial toolkit. The above exploration is just one example of the way colonial language is used to shape our understanding of history and how colonial language has very real consequences that are felt and experienced in the present. Marabou encourages you to not just identify colonial language, but point it out to others and have a discussion. Colonial language is all around us and permeates everyday life, not just museums and history textbooks. When you see it, think about who is shaping the story. Ask, who benefits from a colonial narrative framework and who is disenfranchised by it?